Active Trans Advocacy Manager Maggie Melin recaps her experience at the 2018 National Bike Summit. The National Bike Summit, hosted by the League of American Bicyclists in Washington DC, is an annual gathering of bicycle advocates from across the country. For this year's event held in March, the contingent from Illinois included myself and six other advocates from Illinois representing Ride Illinois, Women Bike Chicago, and other groups from the city, suburbs and downstate. During the 3-day event, we participated in a variety of presentations, workshops and mobile bike tours. On the final and arguably most important day of the summit, we focused our attention on Capitol Hill. We met with our federal representatives and their staffers to discuss the importance of investing in walking, biking and transit. TIGER Grants – TIGER grants are an important source of funding for biking, walking and transit projects. For example, the 41st Street bike and pedestrian bridge, which is expected to be completed by the end of this year to extend over Lake Shore Drive, received nearly $19 million in funding from TIGER. The While House budget proposed eliminating the TIGER grant and steeply cutting Amtrak and other transit funding. To fight this, we asked Congress to support robust federal funding for the TIGER program for FY 2018 and FY 2019. HR 4241 Act – We asked representatives to co-sponsor this bill to create a pilot project to make accessibility and connectivity data available to states and metropolitan areas. The data will show municipalities how well a transportation project (including walking and biking amenities) connects residents to their daily destinations such as schools, jobs, health care and grocery stores. In order to reach as many of our state’s representatives as possible, myself and the other advocates from Illinois split into two groups. My group focused on the Chicagoland region and had the opportunity to sit down face-to-face with Rep. Danny Davis (District 7) and Rep. Dan Lipinski (District 3) (pictured second from left, above). We also met with the transportation liaisons of Rep. Kelly (District 2), Rep. Quigley (District 5), Rep. Roskam (District 6), Rep. Schakowsky (District 9), and Senators Duckworth and Durbin. Responses to our three asks from the offices were mostly positive or, at the very least, the staffers were curious and open to learning more details. Prioritizing safety, investing in multimodal projects and creating a bi-partisan infrastructure plan that fairly supports all communities (not just the wealthiest) were generally agreed upon principles. Most were very supportive of TIGER funding and had already signed an appropriations bill to support it. When we met with Congressman Peter Roskam’s transportation liaison, we were told his support of TIGER was uncertain. Rep. Roskam is a Republican representing parts of DuPage County and the far Northwest suburbs. We shared details of how TIGER funding had benefited his district and our contact at the office promised to relay our messages to the Congressman. After we followed-up, we were welcomed with the news that Rep. Roskam was a yes for TIGER funding! And finally, when we introduced the HR4241 Act to the offices, each said they needed to dig into the details before making a decision. 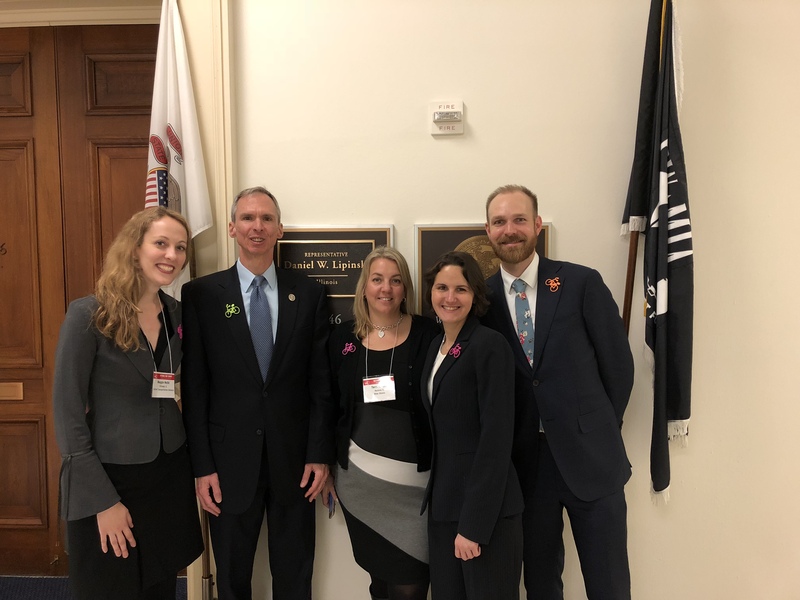 In addition to Rep. Lipinski, who was one of the original co-sponsors of the act, we have now learned that Representatives Davis, Schakowsky, Quigley and Roskam agreed to co-sponsor the bill. And more good news! On March 23, 2018, Congress approved a budget deal that would triple funding for the TIGER program to $1.5 billion for FY 2018 and increase funding for Amtrak and transit (including the CTA’s Red and Purple Modernization Program). President Trump signed the budget into law — a big win for multimodal transportation funding! If you’re interested in contacting your representative in Washington, email me at Maggie@activetrans.org with your district number and I’ll direct you to the best transportation contact.